Today marks the beginning of Tremblant International Blues Festival’s 22nd edition, a more intimate and diverse Festival than ever before! Here is a quick Festival guide put together just for you, to help you make the most of this wonderful event! The Festival takes place in a breathtaking environment with several outdoor stages that are perfect for intimate and lively gatherings. To enjoy the Festival to the max, bring comfortable shoes, plenty of suncreen, a water bottle to stay hydrated under the hot sun, and a rain jacket in case of inclement weather. Armed with these tools, you will be able to enjoy your favourite artists’ performances without a care in the world. 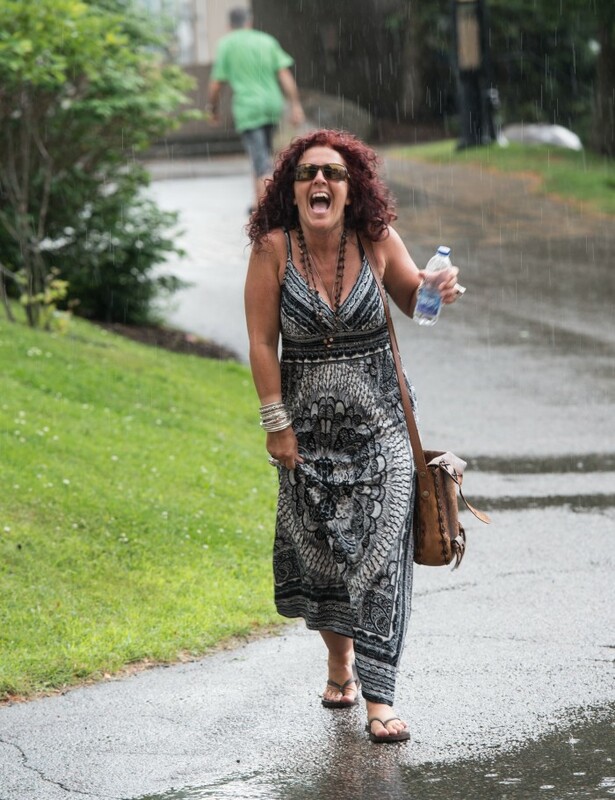 Angel Forrest enjoying the rain in Tremblant, in 2014. This video from Bobby Bazini confirms it: local and international artists alike love being at the Festival and meeting people in the streets of the pedestrian village during their stay. Don’t be shy! Politely approach them and ask for a photo or an autograph. They will happily oblige and you can add your signed album to your precious collection! Make sure you also say hello to the Festival’s new spokesperson, Anne-Marie Withenshaw! This year, the Festival’s MC is hosting his 21st edition (out of 22). Feel free to shake his hand and ask him for a few funny stories or to recommend new bands and artists! Want to be on stage? Our team has cooked up several activities that will give you the opportunity to do just that throughout the Festival. Show us what you are made of by participating in the Blues’araoke, Air Guitar contest, graffiti workshop, live dancing Blues parties and more. Choose from a series of activities and get ready for your fifteen minutes of fame! Many patios provide an outstanding view of the CASINO Stage of Place Saint-Bernard. To eat dinner while enjoying a show, inquire about reserving a table or… arrive early! For a complete list of restaurants, click here. There are also several other stages throughout the resort, where you can choose from seats on the ground level if you want to dance or in the stands, if you prefer to sit! The pedestrian village teeming with happy Festival guests. With over 100 free indoor shows over 10 days, true Festival fans will need to plan their time to catch all of their favourite artists. In case you have a hard time choosing which acts to see, here are a few suggestions. In the evening, bars fill up as Blues shows take over! A few dollars get you through the door, where you can watch exceptional artists at work in an incredible atmosphere. Don’t forget to stop by the Place des Voyageurs’ stage, renamed the “BB King Stage” in order of the Blues legend who passed away in early 2015. Follow us on social media at #tremblant! Throughout the Festival, our team will be scouring the pedestrian village and backstage areas looking for exclusive content to share with you. To keep up with all of the action, follow us on the Festival’s Facebook page! 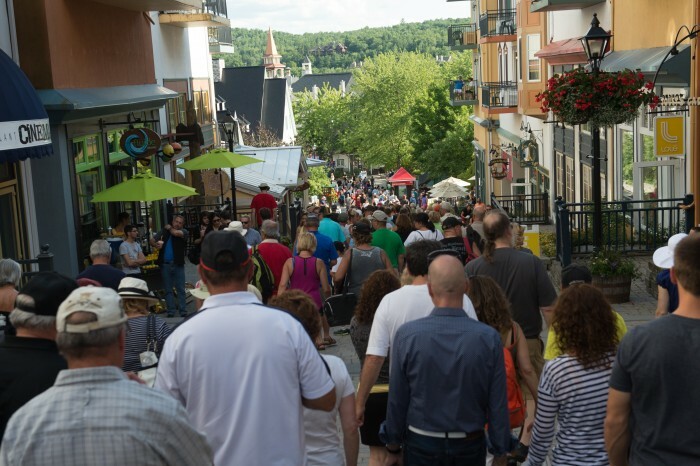 You can also share your Festival’s highlights on social media using #tremblant. For the first time this year, our team will also be active on Periscope for a live remote experience of the Festival. Subscribe to our Twitter feed to see all of the exclusive videos! Now that you can’t wait to be there, time to book your lodging! But hurry up: there are only a few rooms left. It was another great year for the Blues Fest!